DVI's Aviation Safety Experts have investigated numerous accidents involving general aviation, business, and commercial aircraft. We've investigated issues involving improper maintenance, piloting error, crew resource management, adverse weather conditions, loss of control, system failures, in-flight fires, and manufacturing abnormalities. We've also been involved with investigating accidents related to ground and support vehicles, crew access walkways, and runway/ramp environments. DVI's Aviation Safety Experts help clients find answers through the use of scientific methodologies, and the use of the "nine-box matrix" (depicted below). The “nine box matrix” is an investigative tool which helps establish the investigation criteria and scope of work. 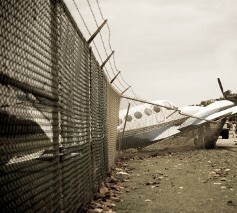 Once the problem is defined, comprehensive accident investigation and wreckage reconstruction techniques are utilized to determine the sequence of events during an accident occurrence. In all cases, DVI's Aircraft Accident Reconstruction Experts provide independent and unbiased analysis, based upon the use of scientific methodologies and physical and factual evidence. In addition to the "9 Box Matrix" and the use of sound scientific methodologies, all of DVI's Aviation Safety Experts and Aircraft Accident Investigators refer to industry best practices such as the ICAO Manual for Aircraft Accident and Incident Investigations and ASTM Standard "E620-11 Standard Practice for Reporting Opinions of Scientific or Technical Experts" and ASTM Standard "E678-07 Standard Practice for Evaluation of Technical Data." The ICAO Manual for Aircraft Accident and and Incident Investigations states: "Accident investigation is a systematic process whereby all of the possible causes of an adverse event are evaluated and eliminated until the remaining causes are identified as applicable to that investigation. Although many accidents appear to be similar to others, this may be misleading. Therefore, it is imperative that investigators keep an open mind so as not to focus on one aspect and thus overlook another. Investigation of accidents consists of three phases: a) collection of data, b) analysis of data, and c) presentation of findings." This practice establishes the criteria for evaluating scientific and technical data, and other relevant considerations, which constitute acceptable bases for forming scientific or technical expert opinions. This practice covers the scope of information to be contained in formal written technical reports which express the opinions of the scientific or technical expert with respect to the study of items that are or may reasonably be expected to be the subject of criminal or civil litigation. 4.1 – "No format specified." 4.2 – "Pertinent Facts: ALL facts pertinent to opinions to be included (4.2.1). Evaluate facts and data per E678 (4.2.2)."